The number of performance estates seems to have expanded massively in recent years but, here at ESM, that’s not enough for us. No, we’re greedy, and we want to see even more quick wagons on the market. To help we’ve come up with a septet that we think should happen. BMW has flirted with M Touring versions of the larger M5 twice in the past, and even went so far as building a concept E46 M3 Touring which never saw the light of day. Is now the time for a compact BMW performance estate? The concept of a 431hp twin-turbocharged 3 Series Touring is rather appealing and, we imagine, adding M3 modifications to the estate bodyshell would make for quite an attractive proposition. Plus, BMW appears committed to covering every possible market niche these days, so this would just be one more addition. Think of it as karma for the 2 Series Active Tourer. Sadly, market demand apparently means that this one falls quite far down the list of possibilities. BMW models are required to have global appeal and an M3 Touring is something that would seemingly only sell in Europe. Audi with the RS4, and Mercedes-Benz with the C 63 AMG, have somehow transgressed this problem, but the men in Munich aren’t convinced. Alpina is already doing a rather good job of building rapid 3 Series wagons, which doesn’t help our case. 2. Ford Focus RS Estate Although the hatchback might have only finally emerged, what better time to add a rapid load-lugger to the lineup as well. The Focus RS hatch is a fairly awesome piece of kit, so making it more practical can only be a good thing, surely? Plus there’s already a Focus ST estate on sale, proving demand exists for quick wagons wearing the Blue Oval badge. With the Volkswagen Golf R notching up sales, there’s certainly buyers out there for estates based on extremely rapid hatchbacks. Plus, the thought of engaging Drift mode whilst on the way to the recycling centre has huge appeal. Ford is already struggling to meet demand for the Focus RS hatch, so adding an estate variant might just be too much to handle. Although, as the RS is built on a regular production line with extra bits added later, surely there would be scope to squeeze a limited edition in there? There’s no precedent for RS estates, and we imagine that’s the excuse Ford would use to bat this away, but everything has to start somewhere. Also, this rendering by X-Tomi Design shows how good it could look. Likelihood – 6.5/10 We’re still hoping on some ultra-limited edition opportunities. Yeah, this one pretty much only came to mind to help our OCD with VW’s current estate model range. 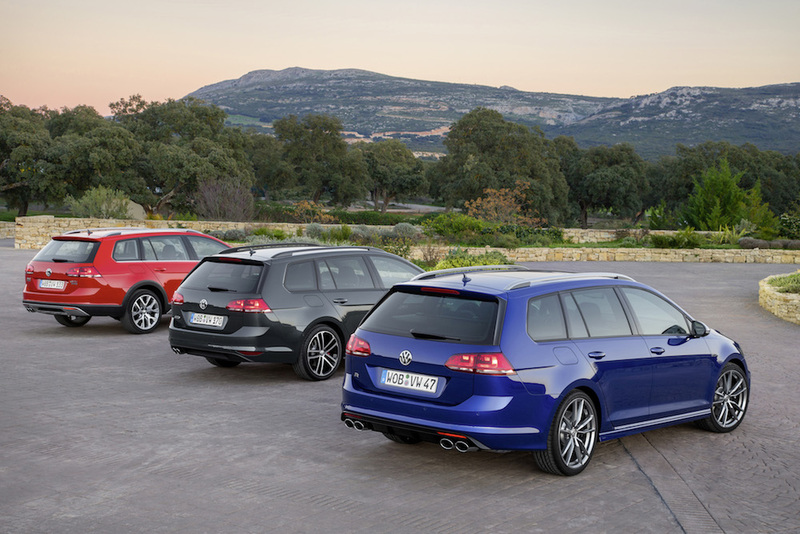 As part of the performance estate lineup there’s a GTD, and an R, Variant but there’s no GTI version! That’s something which happens to unnerve us, ever so slightly, so we’d be a lot happier if Volkswagen just filled that gap. From a technical point of view it would be one of the simplest conversions here, with the MQB architecture allowing plug-and-play platform sharing. Slot in a GTI-spec 2.0-litre engine, add some tartan seat trim, daub some red stripes and additional badges on the outside and you’re pretty much done. We really can’t think of an easier engineering job. So easy that it already exists, in the form of the Skoda Octavia vRS Estate. Which is probably the biggest reason as to why, despite the technical simplicity, Volkswagen won’t produce one. In the complex world of Volkswagen Group dynamics everything must have it’s place, and a Golf GTI wagon would sit far too close to the Octavia vRS in what it offers. We imagine VW would also cite that the GTI brand is recognised for being a hot hatch, and that an estate would detract from this. Shame. Likelihood – 4/10 What if we badged it GLI, like the fast Jetta in the USA? No? Oh. 4. Honda Civic Type R Tourer Similar to the Focus RS, what the world needs more of is estate cars derived from truly mental hot hatches. A Civic Type R Tourer would be the ultimate combination of antique furniture-carrying, and tyre-shredding, behaviour within one single machine. Thus, handily, appealing to both ends of the Honda-buying demographic in one fell swoop. Synchro Motorsport – formed by Honda UK employees – have already built a one-off Type R Tourer, which seems to get us over the technical feasibility test at least. The only downside? Honda’s less than stellar (by their standards, at least) performance in the BTCC with the Civic Tourer during 2014. Shedden taking third in the drivers’ championship was as good as it got, and it was unsurprising that Honda reverted back to the hatch for the following season. Still, we don’t want them to build another racer, we’ll be happy with a road car, thanks. Likelihood – 6/10 How brave are you feeling, Honda. 5. Hyundai i30 Turbo Tourer Much like Katy Perry kissed a girl, and liked it, we drove the i30 Turbo and found it actually rather appealing. It’s not an obvious hot hatch choice, but there’s something quite likeable about that. Plus, it combines all the benefits of a practical Korean-branded family car with extra poke when you need it. So wedging the 1.6-litre turbocharged engine into the Tourer bodyshell should be a good thing. Turbo Tourer sounds like quite a cool name tag, too. There’s a but, however. From doing our research, we can only find evidence of 168 i30 Turbo models being registered in the UK. That’s not a lot. Put it this way – there are more Ferrari FFs kicking about in this country, than there are registered Turbo versions of Hyundai’s i30. We’re playing in a niche market here, so we’re unlikely to see an extra level of speciality added anytime soon. But, with Hyundai’s N Performance brand on the horizon, it may be something that develops a little further down the line. Likelihood – 3/10 The i30 is reaching the end of its lifecycle, so this might have to wait. It shares most mechanical bits with the Hyundai i30 Turbo above, so we already know the score when it comes to technical difficulties. With genuinely handsome looks, it’s perhaps unsurprising that there are currently ten times as many Cee’d GT versions in the UK, compared to the Hyundai offering. So combining that rakish styling with the useful estate body of the Sportswagon seems a no-brainer to us. The new GT-Line trim means it’s almost practically there already! With the potential for over 1,600 litres of boot space, combined with 200hp from the 1.6-litre turbocharged engine, there’s chance a Cee’d SW GT could take the formidable cliche of being “all the car you’ll ever need” if built. We’d also suggest there are no other performance estates out there that could offer a seven-year warranty, which means this thing is practically selling itself. Make it happen quick, Kia! Likelihood – 6/10 More likely than the Hyundai – we’re building that business case now. 7. SEAT Ibiza ST Cupra You remember the Ibiza ST? Slightly left field estate version of the popular Spanish supermini, beloved by those on the Continent. Check your photos from any recent holiday on the Costa Del Sol and it’ll be lurking in the background. Here in the UK we’re not quite so sold on the baby estate concept, but could dropping a 1.8-litre TSI engine under the bonnet fix that? We like to think so, and Skoda seemed to have some success with the old Fabia vRS estate. Currently the fastest Ibiza ST packs a 1.4-litre turbo engine with 148hp, but we think upping that to 189hp using the engine from the Cupra is a much better idea. Look at the success of the bigger Leon ST Cupra and it’s clear the people want fast SEAT wagons! With that classic VAG modular platform, this would be another simple engine swap away from producing a fairly impressive Q-car. Likelihood – 7/10 If it happened, probably likely to be LHD-only. Similar to the old Cordoba Cupra. There you have it – EngageSportMode’s prospective seven fast estates. Now we just sit back and wait.